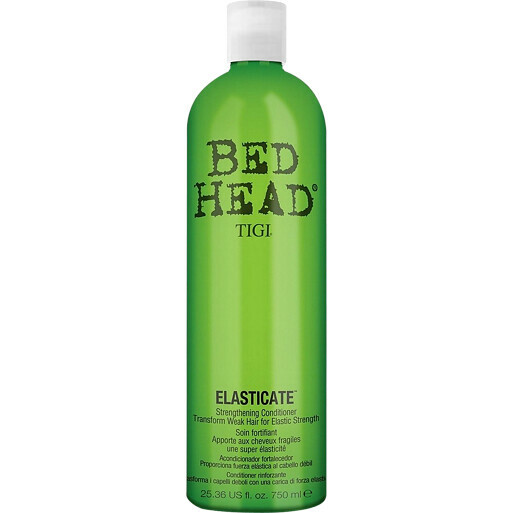 Put the strength back into your hair with the Tigi Bed Head Elasticate Conditioner, a super-charged conditioner that will restore and repair your hair. A welcome relief for brittle, weak hair, the Elasticate Conditioner is infused with sweet almond oil which will smooth and soften the hair follicles. Vitamin A and E work within the creamy conditioner to support healthy hair growth, while hydrolyzed wheat protein help to improve the hair’s strength, shine and texture. The restorative formula is infused with lactic acid which will repair damaged hair, as well as prevent future damage, for hair that looks and feels healthy and revitalised. Dispense a small amount into the palm of the hand and work into a lather on wet hair, rinse well.